It is a daunting task to find a good dentist. Who you choose as the dentist can impact your overall health to a great extent and the effect can be both positive and negative. 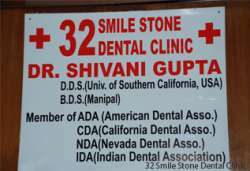 That is why you should always go for a renowned and well-experienced dentist in South Delhi whom you can find at a reputed clinic like 32 Smile Stone Dental Clinic where the professionals are passionate about dentistry and have been serving millions with their dental problems for years together.